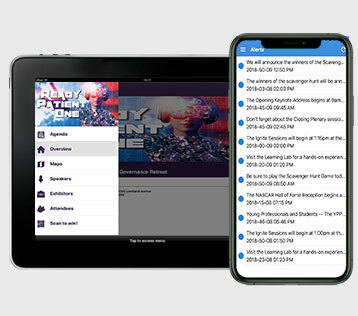 Event organizers can send notification messages to the attendees that appear as push notifications (those tiny pop up messages) and in the alerts section on their device. Send welcome notes, information about changes in the sessions, or other special information that you want to send to them on the fly during your event. Be connected! Add intelligence to your alerts by setting the time zone for your event and then scheduling notifications to be sent out in the future. Use the scheduling feature to organize distribution of alerts to your attendees over a span of time.